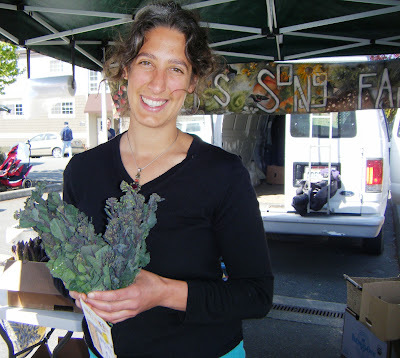 When I showed up at the Edmonds farmers market for its seasonal debut a week ago Saturday, I posed the question to Nate O’Neil, owner of Frogs Song Farm on Skagit County’s Fir Island. Unfortunately, by the time I arrived, he’d just sold his last bouquet of “cabbage rabe.” While that’s not what he calls it (more on that in a bit) Nate knew exactly what I was talking about. His wife, Shannon Dignum, sold me several bunches ($2/each) this weekend. 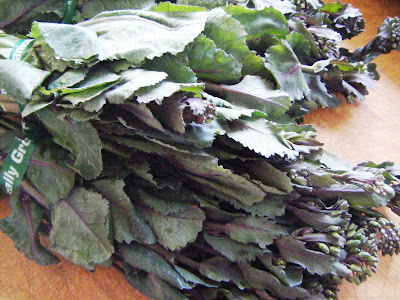 Organically grown red cabbage-shoots: So good, and so good for you! “I call it broccolini,” he admits, though he’s aware that Broccolini is a registered trademark of Mann’s, a produce packing company, and goes by many other names including “Aspiration” and “baby broccoli” (also inaccurate, since it’s a hybrid cross between broccoli and gai lan — or Chinese kale).